While looking for some Halloween ideas I stumbled across the Shrunken Head Cider on the Martha Stewart website. It looked easy, so I decided to make it for my Halloween party. 1. Preheat oven to 250 degrees. Line a baking sheet with parchment paper; set aside. In a medium bowl, mix together lemon juice and 4 cups water; set aside. 2. Peel apples and cut each in half through the stem; remove seeds and core. Using a sharp paring knife, carve a face, as desired, on the rounded side of each apple half. Place apples in lemon mixture. 3. Place apples, face-side up on prepared baking sheet and transfer to oven. Let bake until apples are dry and begin to brown around the edges, about 90 minutes. Remove apples from baking sheets and press cloves into the "eye" sockets. 4. 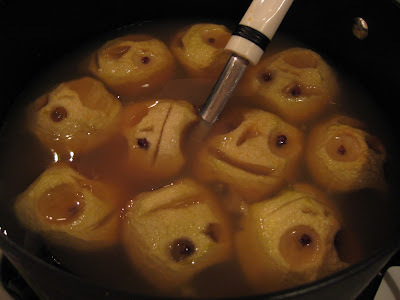 Combine cider, lemonade, and rum (if using) in a large punchbowl; float shrunken heads on top. not to be a stickler, but shouldn't then title be shrunken instead of shrunked? thanks! didn't even notice that!